Side-cutting pliers. Comfort-grip handles. Cuts copper or aluminum wire. Serrated, square tip jaw for extra grip on bolts. Tempered carbon steel blade and screwdriver. Ergonomic high leverage grips for maximum torque, molded and insulated shaft rated to 1000 volts for protection when working with electricity. 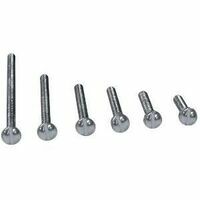 Hardened chrome vanadium steel, with magnetic tips. 2 piece set, SCE-3252 - No. 2 Phillips tip and SCE-3256 - 3/16" slotted tip. Carded. Easily tighten and loosen locknuts in tight spaces. Thin tools fit a majority of UL locknuts. Etched markings allow for easy identification; clearly marked tighten and loosen ends make usage a breeze. Hooked tips latch onto locknuts and maximize turning leverage. Durable lightweight tools fit easily in a pocket. Includes: (1) 1/2" wrench, (1) 3/4" wrench and (1) 1" wrench. Length: 5" - 6-1/4".